5:30pm: Guided walk to points of interest in Eugenio Montale’s childhood. Adequate footwear required for walking/hiking on unpaved paths. The walk will last circa 1 1/2 hours and is free of charge but limited to 25 participants. To reserve call +39 346 8299811 or +39 339 8340911. The meeting point will be at the TI office at the 1st platform at Monterosso’s train station. 7:30pm: A free welcome aperitif will be served. 8:30pm: Tales will be recounted of the ties between Montale’s poetry and Monterosso (and the Cinque Terre). 9:15pm: Madrigal homage to Montale’s poetry (with a pianist, soprano and narrator). 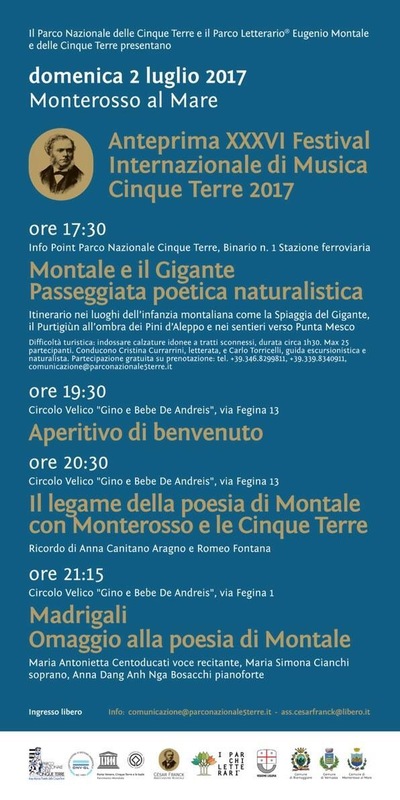 The latter three events are all free of charge and take place at the Circolo Velico “Gino e Bebe De Andreis” located in the Fegina neighborhood of Monterosso at via Fegina #13.